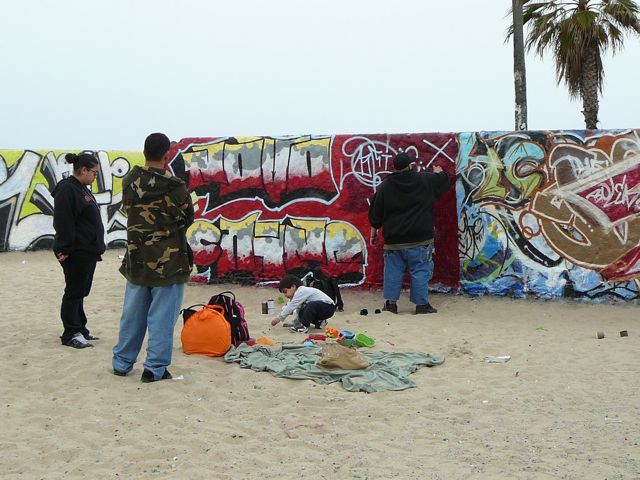 Back in March of 2007 I took a friend from out of town to Venice Beach (it was on his list of places to see). 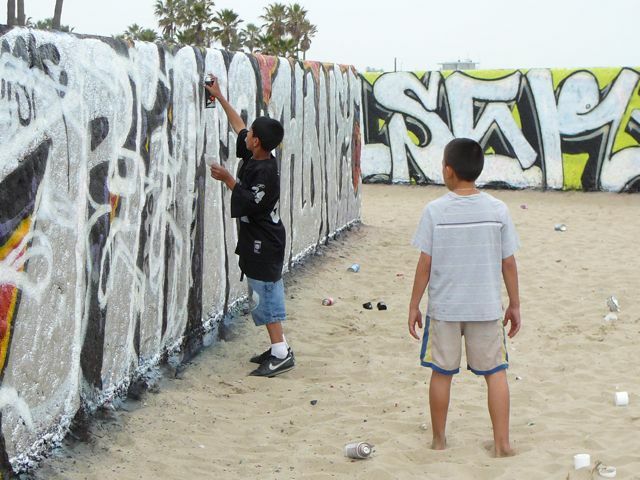 I've been to Venice Beach hundreds of times over the years, and thought I'd "seen it all." But even I was a little surprised what we experienced. Apparently, the City of Los Angeles decided to allow - even encourage - graffiti and "tagging" in a small area along the boardwalk. Huh? I guess the idea being: "vandalism and graffiti is going to happen; let's set aside one area where it can actually be legal." 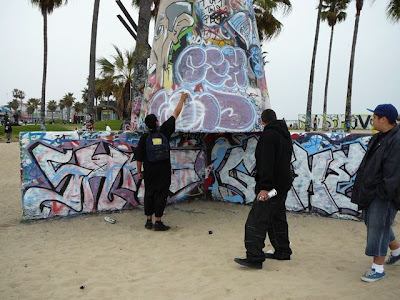 If you've never actually been to Los Angeles, vandalism caused by tagging has absolutely exploded in terms of impact and damage. It's a HUGE problem for the city, costing tens of millions of dollars every year to clean up. So it's hard to believe that the city would actually ENCOURAGE it - anywhere. 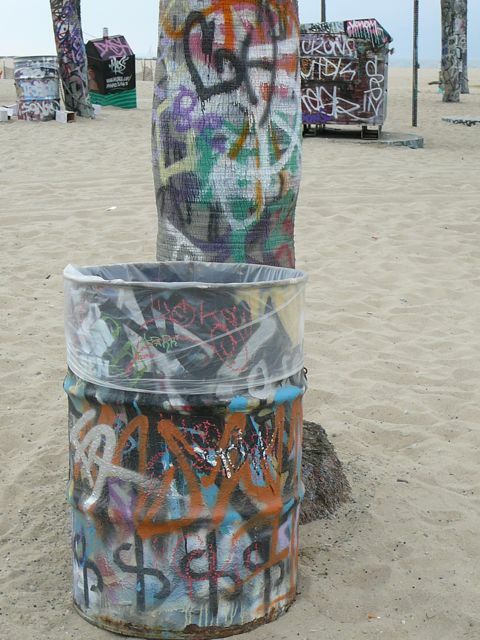 Even at Venice Beach. Looks like mom and dad brought their kids. Just another day at the beach. Yes, there is an aspect to graffiti that can actually be considered art. Maybe not my style, but art none the less. 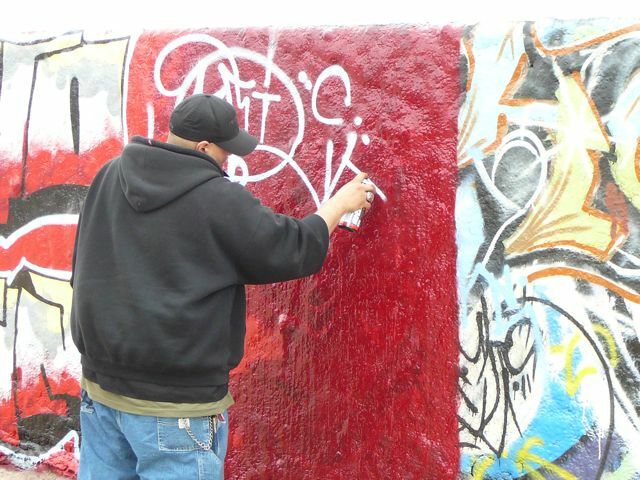 But much of what we saw was simply tagging. Like this. Next to the "designated" area, a palm tree was covered with graffiti. This is art? Here's another view. Welcome to the beach. After walking around a bit, we headed back to my car. 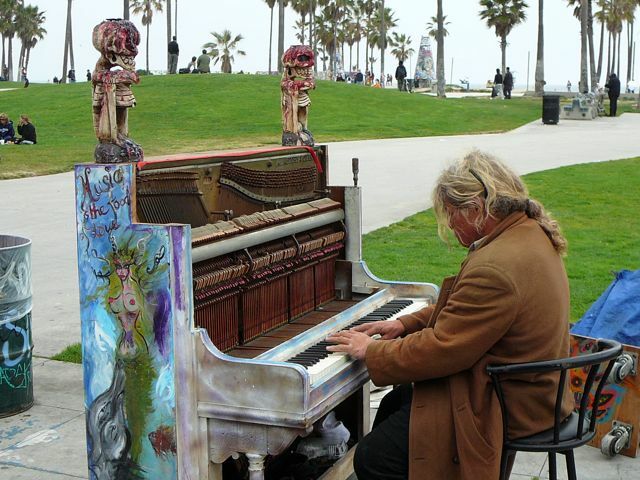 Spotted the Piano Man on the Venice Beach Boardwalk. Just one of the cast of characters that are part of the local community. A block away was a beautiful mural on the side of a building. 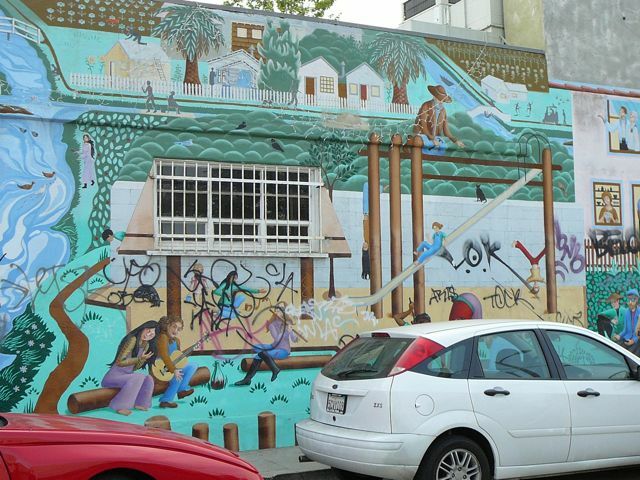 Correction, formerly beautiful mural. 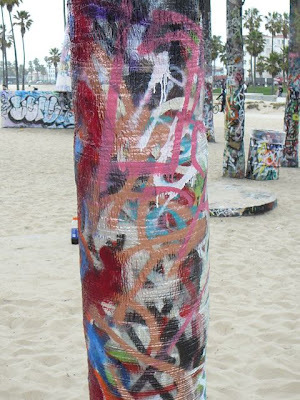 Beautiful until it was vandalized by taggers. 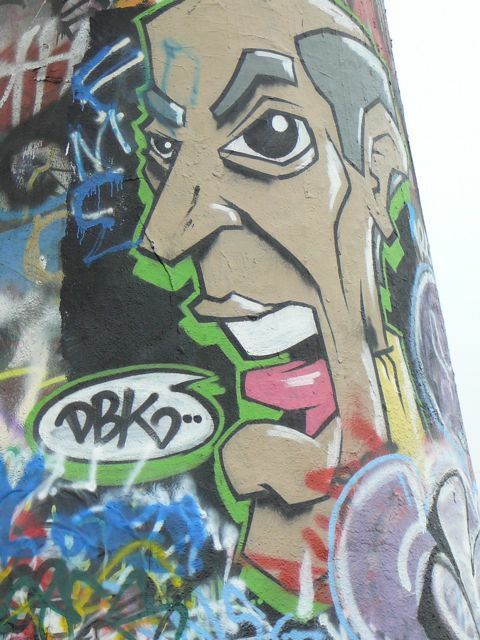 It's bad enough the see graffiti like this on blank walls. But on someone's artwork? I wondered if whoever did this "practiced" down the street on the city sponsored graffiti walls? 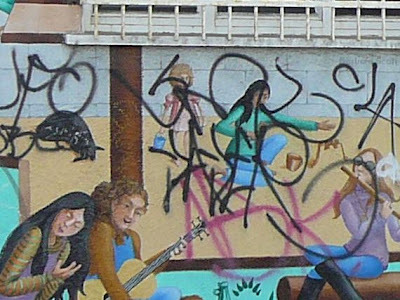 There are thousands of murals throughout Los Angeles, and - unfortunately - hundreds of them have been vandalized by taggers. 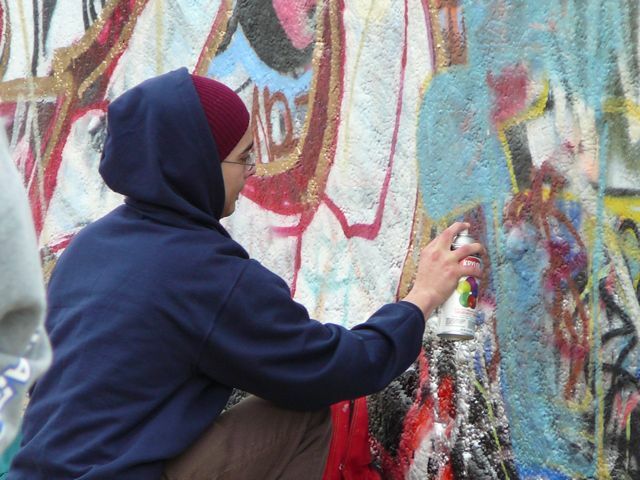 In some cases, the artists gave up and their work was painted over. Once again, poorer communities bear the brunt of this. As an aside, my family and I were in Chicago for six weeks this past summer. NO graffiti - anywhere. And NO barbwire keeping people off freeway signs, walls, billboards, etc. 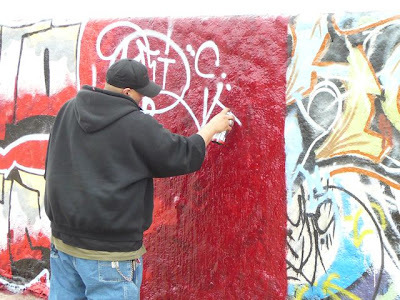 The City of Chicago simply made it illegal to buy, sell, use or possess spray paint within city limits. Guess what? NO graffiti. Kind of nice.